Salt Lake Community College offers a wide array of different events for students, including art exhibits. These exhibits not only include beautiful paintings, but the artwork has a hidden message as well. The featured art exhibit this week is the “Modern Botanicals” exhibit by artist and student Alexis Furlong. Modern Botanicals is a form of art which includes many paintings of flowers and plants, which has been practiced for centuries, with some paintings dating back to Ancient Greece. Today, botanical art is becoming more popular. Many students that were on their way to class were checking out the art exhibit. “If you’re a student who loves plants and nature, then I highly recommend this exhibit, it also provides an inside look on our current society,” says one student. The painting stands out among the brightly lit LED walls. According to the event description on the SLCC Calendar, botanical artists depict the ideal version of a plant by sketching and painting numerous specimens of plants and flowers. The final piece is devoid of its natural imperfections. Furlong depicts what seems to be a perfect ideal flower. To apply her own spin on things, she applies her own taxidermy to each painting and the scientific name. Her work is meant to be a reminder of the natural world and that motivated the creation of these paintings. This exhibit is a very important look into our world; when you look at each painting you can experience the beauty of each individual plant. 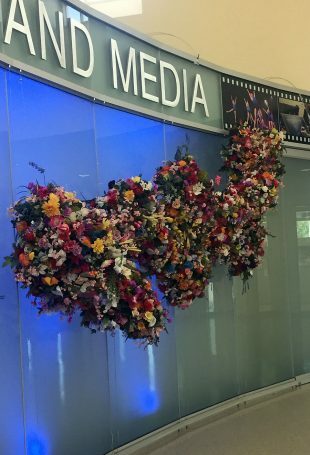 The exhibit also featured a colorful flower wreath which wrapped around the wall above the Center for Arts and Media. Located in the hallway entering the Center for Arts and Media, the “Modern Botanicals” exhibit is open 7 a.m. to 10 p.m. through Oct. 1.